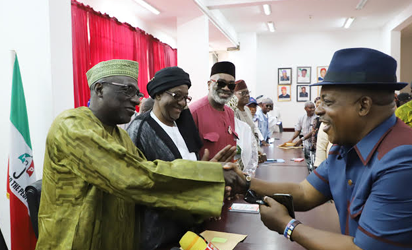 The Peoples Democratic Party (PDP) Post-Convention Reconciliation Committee yesterday visited Professor Tunde Adeniran, one of the chairmanship candidates of the party in the recently concluded elective convention. The Governor Seriake Dickson-led committee met with Adeniran, who in the spirit of reconciliation asked the team to reach out to all those who felt aggrieved for one reason or the other. The Special Adviser (Media Relations) to Governor Dickson, Mr. Fidelis Soriwei, quoted Adeniran as having made the comment while playing host to the committee on Tuesday night. The Professor of Political Science noted that Dickson assumed the position of the chief conciliator of the party not just because he is a governor but because of his passion and love for the party, his integrity and sense of fairness and justice. “You said something earlier on that may be, what prompted you to lead this team is because you are a governor. I believe far much more than that; there are certain qualities that majority of us have come to appreciate in you ,which you should keep up. “I don’t see any genuine member of this party who will question your choice for this kind of role. It is not necessarily because you are a governor, it is because you are passionate about this party, it is because you have a sense of fairness, you also believe that things should be done properly, as you carry everybody along in what you are doing, ” he added. Also speaking, ex-Minister of Information and National Orientation, Professor Jerry Gana, who was visited by the committee, said he would never leave the PDP for whatever reason, adding that he would give counsel on how to make the party stronger. The Committee also visited erstwhile Minister of Women Affairs, Hajia Inna Ciroma, who contested for the position of Deputy National Chairman (North) and a former Deputy Senate President, Ibrahim Mantu. Mantu said Dickson’s choice for the position of the chairman of the reconciliation committee was divine given his commitment and service to the party. He advised the party to focus on the 2019 elections with resilience and determination. Mantu further noted that regardless of the shortcomings of the PDP while in power, the All Progressives Congress (APC) was no alternative platform for the electorate in 2019.